As determined by the Moldovan Declaration of Independence, which the Constitutional court of Moldova found to take precedence over Article 13 of the Constitution, which uses the name "Moldovan". Date of proclamation. Independence subsequently finalized with the dissolution of the USSR in December 1991. Moldova is a country in Eastern Europe. 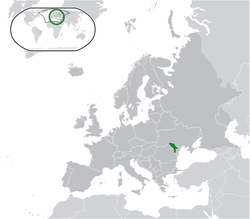 Its full name is the Republic of Moldova (Romanian: Republica Moldova, listen (help·info).) It used to be called Moldavia. The official language in Moldova is the Moldovan language, which is very similar to the Romanian language. The capital of Moldova is Chișinău. The Russian Empire took Moldova from the Ottoman Empire in 1812 and called it Bessarabia. It became independent from Romania when the Soviet Union collapsed. The average monthly salary/wages are still low, standing at only $243 USD. Moldova is an associated country for future membership in the European Union. ↑ 1.0 1.1 "Chișinău recognizes Romanian as official language". Radio Free Europe/Radio Liberty. Associated Press. 5 December 2013. Retrieved 6 December 2013. ↑ Roudik, Peter (23 December 2013). "Moldova: Romanian recognized as the official language". Law Library of Congress. Retrieved 13 June 2014. ↑ "The text of the Declaration of Independence prevails over the text of the Constitution". Constitutional Court of Moldova. 5 December 2013. Retrieved 13 June 2014. ↑ "On the situation of Russian schools in Moldova". OSCE. July 14, 2011. ↑ "Ион Гучак: На русском языке свободно говорит половина молдаван". Русский Мир. October 17, 2013. ↑ "Russian language in Moldova could lose their status (Русский язык в Молдове может потерять свой статус)". KORRESPONDENT. April 6, 2013. ↑ National Bureau of Statistics of Moldova (2 January 2015). "Preliminary results of the 2014 census". Press release. http://www.statistica.md/public/files/Recensamint/Recensamint_pop_2014/Nota_informativa_Preliminare_Recensamint_2014.pdf. ↑ "National Bureau of Statistics of Moldova" (in Romanian). Retrieved 9 October 2013. ↑ "2004 census in Transnistria" (in Russian). www.languages-study.com. Retrieved 9 October 2013. ↑ 11.0 11.1 11.2 11.3 "World Economic Outlook Database, April 2016". International Monetary Fund. April 2016. Retrieved 14 April 2016. ↑ "World Development Indicators: Distribution of income or consumption". The World Bank. 2014. ↑ "Moldova". Oxford Dictionaries. Oxford University Press. Retrieved 30 January 2016. ↑ "Moldova". Dictionary.com Unabridged. Random House. Retrieved 30 January 2016. ↑ www.eltonic.com, Eltonic -. "Average salary in Moldova goes up 8.2% - Moldova Azi". Retrieved 8 December 2016. ↑ "Romania lobbies for EU entry 'perspective' for Moldova". Retrieved 8 December 2016. This page was last changed on 27 August 2018, at 20:40.